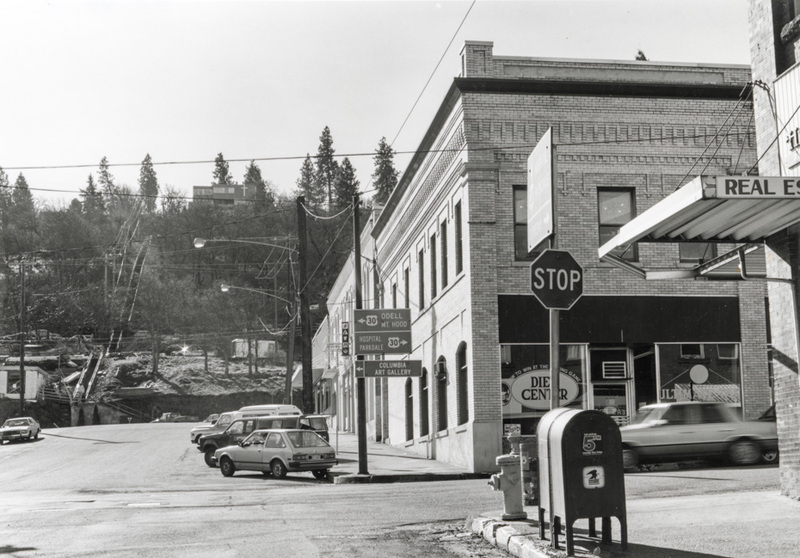 Here's a view of 2nd and Oak from the not-too-distant past. The year is 1988 and "The Diet Center" and "Ultimate Tan" occupy the first floor of the Hall Building. This is pre-urban renewal, so there is no fountain and plenty of electric poles and wires. You can see the Second Street Stairs and the Jensen home up on the hill, complete with Christmas lights. A rare sunny day in winter, perhaps? I notice the building at the top of 2nd Street has only one floor. I believe the second floor (basically everything above the stone foundation) was taken down just prior to building Horsefeathers. The first thing I tried to figure out was, "where is the Horsefeathers building?" My kids took gymnastics in a building there, in about 1977. It was a large building. Is that the building that was Meyer's Cleaners? Mr. and Mrs. Joe Meyer sent our family a Christmas card every year. They had a son that was killed in Europe during WWII and when my dad was stationed in France he went to the grave sight and sent pictures of it to his parents. Lt. Joseph "Joe" Meyer, aka, "Peachy", was mothers, (Maryann Scearce's), fiance when he was killed while on return from a bombing run over Hamburg, Germany in the Fall of 1944. He flew a P-47 Thunderbolt and was part of the, "Vargas Squadron", so named for the pin-up girls they had painted on their planes. They were also known as the, "Hun Hunters." He was an ace pilot and was awarded the Distinguished Unit Citation for his assistance in smashing two German columns near St. Lo, on July 11, 1944. He was also awarded posthumously by the War Department, the Air Medal and four Oak Leaf Clusters, for his service to his country, as a member of the 29th Tactical Air Command, 389th Fighter Squadron, 366th Fighter Group, stationed in England. I was fortunate to inherit from mom some things that were given her by Joe, among them his silver wings, and will cherish them always. They had been childhood sweethearts and his loss was truly a tragedy. In the 1940's, the storefront on the 1st floor of the building we see housed Gambles Bookstore. Sorry--that was a typo. It should be Gables.